Wise, Va. — The Solar Workgroup of Southwest Virginia is pleased to announce that the team led by NCI, Inc. of Richmond, VA has been awarded the 1.5-megawatt Southwest Virginia Solar Project Portfolio. NCI teamed with Acorn Electrical Specialists (Piney Flats, Tenn.) and RockBridge Energy (Savannah, GA) to complete the Request for Proposal. The portfolio includes six final project sites in Southwest Virginia: the Wetlands Estonoa Learning Center and the University of Virginia-Wise Oxbow Center, both in the town of St. Paul in Wise County, the Lonesome Pine Industrial Center in the town of Wise, Norton Green Apartments in the city of Norton, Central High School in Wise County, and Ridgeview High School in Dickenson County. The NCI project team will now begin negotiating individual contracts with these entities to reach final agreements on installation at the six sites. If all go through, the total solar energy would amount to 1.5 megawatts. Communities in Virginia’s historic coal-bearing region have been increasingly collaborating with a range of entities to identify and implement new, innovative economic initiatives to diversify the economy. The Solar Workgroup of Southwest Virginia comprises nonprofit and community action agencies, colleges, state agencies, planning district commissions and other interested citizens and businesses seeking to develop a renewable energy industry cluster in the region. The workgroup is supported through a grant from the U.S. Department of Energy Sunshot Initiative, and is co-convened by Appalachian Voices, the UVA-Wise Office of Economic Development & Engagement, and People, Inc., with facilitation assistance from Dialogue + Design Associates. The group issued its Solar Services 2018 Group Solicitation Request for Proposals on July 31. Increase solar installations in the seven counties of Southwest Virginia through a group procurement solicitation process which will result in reduced pricing for site building owners through a competitive selection process. Improve career development and job opportunities in renewable energy for individuals in Southwest Virginia. Develop educational partnerships that create awareness of sustainable energy and its impact in the community, the economy and the environment in Southwest Virginia. 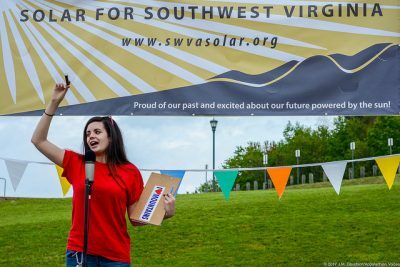 The Solar Workgroup of Southwest Virginia is a collaborative action team that resulted from the 2016 SWVA Economic Forum hosted at UVa-Wise. The mission of the workgroup is to jumpstart a locally rooted solar industry in far Southwest Virginia that maximizes local economic impact. Appalachian Voices is a leading non-profit advocate for a just economy and healthy environment in the Appalachian region, and a driving force in America’s shift to clean, renewable energy. NCI is a team of people working together as a company to deliver outstanding solar construction services for our customers, our trade partners, and our communities.